What makes for a truly Holistic and Integrative Medicine? 1. Can it be that our modern obsession with disease is misplaced, taking our collective attention away from the real problem: disenchantment? Have you ever wondered how such diverse experiences and worlds as cybernetics, Bushmen healing, the modern ICU, gardening, complexity science, martial arts, Molluscan mating behaviour, epistemology and ontology, orthopedics, improvised performance, radical constructivism, laying of hands, Chaos theory, jazz music, Greek mythology, paradox, hypnosis and psychosis, evolution and embryology, ethics, snakes eating their own tails, a fictional post-apocalyptic strategy game, a New Orleans funeral, and finger painting are intimately related to Health: including the health of you, the health of me, and the health of the world we live on? If you are the least bit intrigued, then know there is hope for us all. Join Dr. William Sutherland on this tour de force of tall-tale telling and let the “patterns that connect” embrace you as you begin your reintegration back into Wholeness. Welcome to the enchanted woods of Complexity Medicine, where one can truly see the forest through the trees. 2. A deeply embodied and thoughtful foray into the philosophy, science, and phenomenology of Chaos, Complexity, Holism, and Health. Take a transformative journey with the Doctor and be glad that you will never be able to see the world the same again! 3. Dr. Sutherland is about to prescribe you six words that you are unlikely to hear in any other doctor’s office but which are absolutely vital to your vitality:Service, Sensuality, Performance, Beauty, Ceremony, and Love. Intrigued? Just wait till you experience the Good Doctor’s healing ministrations in a metaphoricand mythological appointment that you will never forget. 4. Join the Doctor on a holistic journey starting with our species’ earliest healing and spirited expressions, then on through the ages to the emerging Science of Complexity; connecting the dots in between as we go. 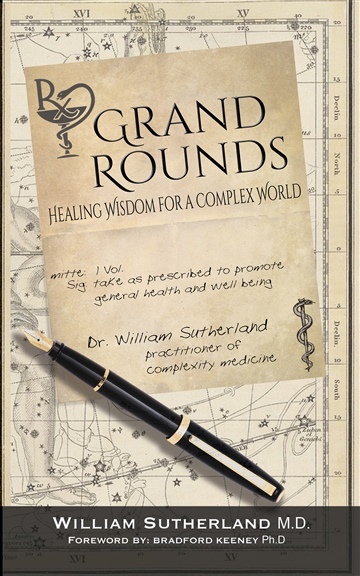 Grand Rounds is a healing balm to our collective individual, cultural, ecological, andevolutionary ails. Come and enjoy the magical & mirth-filled medicine that Dr. Sutherland has prescribed. 5. This is the book you have always deeply knownthat you needed to read without knowing it! (I know it was the one that I always needed to write). I have known Dr. Sutherland for many years, beginning when he asked to have a conversation with me when he was a teacher of the martial-arts. I have watched him make his life more complex by immersing himself in the arts, cybernetic thinking, ancient healing culture, and contemporary medical practice. I can testify that he is a damn good doctor and that his good doctoring is held inside a deeper holding than outcome studies based on simplistic probability theory. He stands on wisdom and fears not to encourage his colleagues to be more human and more healing in their manner and being. He goes past primum non nocere (first, do no harm) and moves toward praescribens vitae (prescribing life), acting so as to expand both the medical universe and the choices for action that may arise whenever doctors and patients face the mysteries of how life and death, as well as wellness and sickness, dance together. Dr. Sutherland deserves to be the next important leader of medicine, bringing it out of the dark ages of overly-simplistic causality and the kind of arrogance that a paucity of complex knowing/know-how breed. He stands for the whole that can make medicine holy. His Grand Rounds is an invitation to return to Hippocratic aesthetics, the art of fostering healthy personhood rather than merely attacking any dis-ease with disease. Welcome to the complex age of medicine, as medical doctors return home to embrace ancestral ceremonial ground and make room for reawakened wisdom.